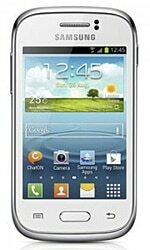 The Samsung Galaxy Young is a compact, affordable Android smartphone available in both NFC and non-NFC versions. The GT-S6310N is the model with NFC; the regular GT-S6310 does not have the technology onboard. The Galaxy Young has a 3.27-inch screen and runs Android 4.1.2 Jelly Bean. No NFC in that as far as we are aware. I have the above pictured model. Samsung Galaxy. Super phone for the money. With so many features the memory clogs up quite quickly. Could someone tell me how to delete the whole memory- easily? If the memory is full it stops Whatsapp working and other things.